US, UK Partner in Swarm and Search AI Challenge » UAV DACH e.V. The US Air Force Research Laboratory, Wright Brothers Institute, and University of Dayton Research Institute will release the first scenario for its “Swarm and Search AI Challenge” this week, though teams officially have until Feb. 12 to register. The challenge, which will occur concurrently with a similar challenge being conducted in the United Kingdom, was designed to figure out how to plan and control simulated swarms of small unmanned aerial vehicles as they map a wildfire. 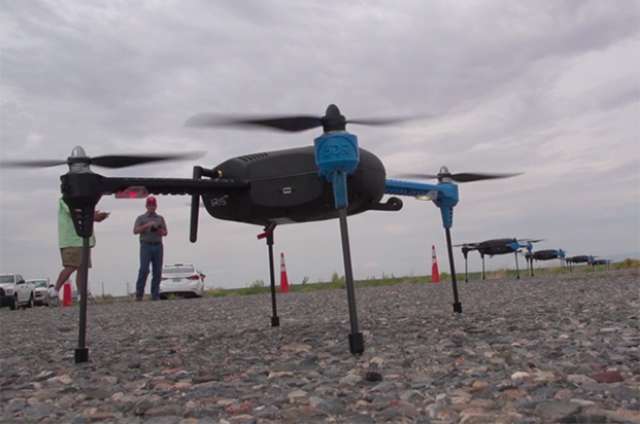 All the teams will use the same UAV design and sensor set, which is based on an AFRL platform, as well as artificial intelligence technology to come up with the most effective way to accomplish the mission. The United Kingdom Forestry Service will post videos for all the teams to view outlining the scope of the problem, Mick Hitchcock, senior technology advisor for AFRL small business, told Air Force Magazine. The events will be conducted simultaneously, though separately, in the US and UK. Hitchcock said he hopes to have 15-20 teams participating in the United States. UAV DACH: Beitrag im Original auf https://www.uasvision.com/2019/02/06/us-uk-partner-in-swarm-and-search-ai-challenge/, mit freundlicher Genehmigung von UAS Vision automatisch importiert. Der Beitrag gibt nicht unbedingt die Meinung oder Position des UAV DACH e.V. wieder. Das Original ist in englischer Sprache.